Professor Patricia Crain of New York University has been selected to receive the 2017 Early American Literature Book Prize, which is awarded in odd calendar years to a second or subsequent monograph, and in even years to a first book. 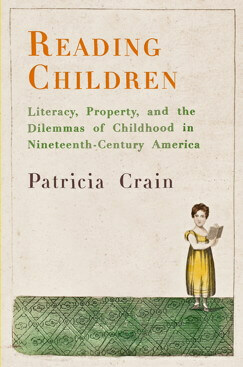 Crain’s book Reading Children: Literacy, Property, and the Dilemmas of Childhood in Nineteenth-Century America was published by the University of Pennsylvania Press in 2016. Reading Children makes a “stunning contribution” to the field of childhood studies by showing the long colonial history of children’s reading practices. The committee noted Crain’s creative relation to temporality, which “depends upon contradistinction and juxtaposition” rather than linear development. Underlying this entire project is a deep commitment to ensuring that early American literature be understood both on its own terms and as a key component of 19th-century American literary production writ large. Another strength noted by the committee is the wealth of archival discovery that forms the study’s backbone. In many ways, this is a book about sensory and material culture – what children saw, heard, sang, scribbled – the paper doll clothes they cut out and interleaved in their gift books, and the gorgeous and prolific illustrations help make that sensory experience available to the reader. It is Crain’s good fortune that Penn Press dedicated itself to printing the images in such glorious fidelity. But it is her conviction that these images are worth printing – and her independent-minded commitment to showing why – that makes the book itself so very remarkable. With a breadth of scope in envisioning different sorts of young readers, Reading Children challenges a range of established arguments about and approaches to literacy and reading. In order to explore the literary and oral reincarnations of the “Babes in the Wood” story, for example, Crain delves into ballad and broadside history to show how literacy became a sine qua non for children and how romantic ideas devolved upon the image of the child. The chapter on Cherokee children offers a classic case study in the history of American reading, attuned to the particularities of these Native students’ circumstances. In later chapters, childhood comes to represent a state that exists in adults’ minds to represent something they have lost: a presence to which they no longer have access. Childhood becomes a placeholder for incomprehension. It’s not something that those described as “children” experience, but rather something adults wish they could do more than contemplate. In this, it is both like and linked to reading. As Crain writes, “All reading enacts prosopopoeia, the figure that describes the imagined presence of absent others” (113). So, of course, do all children, in the minds of those who see in them something they had not known that they themselves once were. The University of North Carolina Press along with the EAL editorial team and the other members of the committee, congratulate Pat Crain for her outstanding contribution to early American literary studies. Next year's prize will be awarded to an author’s first book, with monographs published in 2016 and 2017 being eligible. The prize alternates between second or subsequent books by established scholars in odd calendar years and first books in even years. It is accompanied by a $2,000 cash award. Please consult the journal’s website or contact Professor Sandra Gustafson (Gustafson.6@nd.edu) of the University of Notre Dame for details.